The term “tech ninja” (and its first cousin “goth ninja”) has been banished from vernacular into the dungeon of cringe-inducing 2014 fashion forum slang. Yet its essence covertly lives on, hijacking common perception of what techwear is and should be. Essentially, the massively complex terms is boiled down to a rudimentary—and highly conspicuous—silhouette of Acronym’s J1A-GT zipped up over a face mask, grid-checked Guerrilla Group tank and a pair of P24s that some scoff at as “school shooter” wear. This corruption of technical wear—which should broadly encompass any “clothing for everyday life with special fabric, construction and properties that allow for breathability, movement, water-resistance and comfort”—is rooted in techno-orientalism, the phenomenon in which East Asia and East Asians are imagined in hyper-technological terms. This stereotype predicts an “Asianized” future, wherein global society dangles between aggressive modernity and dystopic living conditions. Such representations emerged as the West watched in simultaneous awe and fear of East Asia’s rapid development in the latter half of the 20th century. Exacerbated by Japan’s economic boom, fortified by China’s manufacturing might and invigorated by the rise of tech-centered chaebol like Samsung and Hyundai in South Korea, the “East” was suddenly unfairly characterized as innovation-driven future overlords. Techno-orientalism helped birth speculative fiction and cyberpunk, which have undeniably influenced techwear’s development. Genre-defining works and their landscapes are ridden with East Asian references, from William Gibson’s dystopic take on Chiba in his novel Neuromancer to the Blade Runner franchise’s billboard geishas and Japanese- and Chinese-littered signage and even video game Deux Ex: Human Revolution’s reimagining of the currently pastoral Hengsha Island into a two-story megacity. 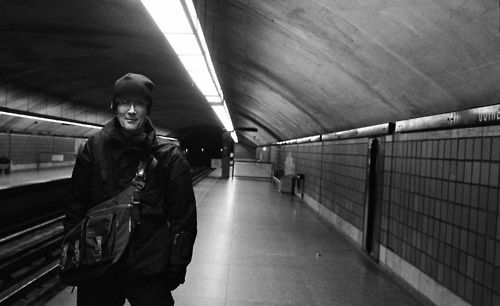 Acronym, Hugh’s full-time project, is one of the earliest explicitly “techwear” labels and is the likely cause behind the term “tech ninja.” Acronym’s promotional videos are dubbed “Acronymjutsu”—jutsu meaning technique, method, spell or skill in Japanese, commonly associated with Masashi Kishimoto’s hit anime Naruto). A 2010 video featured excerpts from the bloody anime film Ninja Scroll. Beyond the P25, a pair of pants inspired by traditional karate gi, and the aforementioned videos, Acronym has not produced anything blatantly inspired by East Asia. In fact, Acronym has maintained a steady focus on functionality over the years, though the label has arguably embraced more aggressively fashion-forward design in recent seasons. Unfortunately for Gibson, subtlety was pushed to the background when techwear joined the ranks of popular science fiction media, mutating from a garment type rooted in innovative materials and ergonomic construction to a commodified, profitable aesthetic. The definition of techwear circulating on the internet became heavily coordinated ensembles limited to a narrow selection of silhouettes and designers. With its (justifiably) limited supply and high price tag, Acronym quickly became a social media status symbol. Unlike many cyberpunk works that have been slammed for exploiting East Asian culture without adequate East Asian representation, techwear is developed and consumed by Asians: Errolson Hugh, despite his ethnically ambiguous name, is of Chinese-Jamaican descent; Guerrilla Group and 4Dimension are based in Taiwan; Taobao labels riffing on techwear are based in China; and Instagram accounts like acrhive and techwear.looks are filled with kitted out Asians. The role East Asia plays in proliferating and prolonging the “tech ninja” take on techwear is complex and echoes Japan’s reclaiming of cyberpunk. Japanese cyberpunk focuses less on the dramatic, tech-infused dystopias familiar to Western audiences and more on issues of dehumanization and invasiveness inflicted by technology and machinery on individuals, taking cues from Western body horror films like David Lynch’s Eraserhead or David Cronenberg’s Videodrome. What Japanese cyberpunk is internationally recognized for, however, are titles like Katsuhiro Otomo’s Akira and Masamune Shirow’s Ghost in the Shell, which married Western cyberpunk’s neon-lit cityscapes with the Japanese counterpart’s questions regarding humanity in the face of technology. The resounding success of Akira and Ghost in the Shell provided an entire generation with visual and conceptual inspiration. With an established homegrown link to Western cyberpunk, East Asian brands perhaps felt it appropriate to mix techwear with traditional dress to create increasingly exaggerated pieces befit more for screens than for real life.